SEOUL Weekly: SEOUL’s 2015 UMF Korea Event! Web Planner/Editor/Writers WantedSEOUL Magazine is looking for two people who can help develop our online presence as a part-time web planners/editors/writers. You should be familiar with WordPress, have an interest in restaurants, events and other goings-on around town. Daily posting required. Attendance of a weekly meeting preferred, too. Space in our office and a computer can be provided if you need it. If you’re interested, send a resume to our magazine PD Kim Hansol at pubco@seoulselection.com or give her a call at T. 02-734-9539. Be sure to tell us your areas of interest, too. SEOUL Magazine is always looking for contributors. If you’d like to write for our magazine, send a resume to pubco@seoulselection.com. SEOUL’s 2015 UMF Korea Event! Wanna see the world’s hottest electronic music event – featuring the likes of Hardwell, Skrillex, Porter Robinson, David Guetta, Quintino, Snoop Dogg, Lil Jon and CL – for free? Well, join SEOUL Magazine’s 2015 Ultra Music Festival in Korea event! 1. First, post a shot of yourself holding a copy of the June issue of SEOUL to Instagram. Be sure to tag the photo @seoul_magazine. And follow our account! 2. Then go to our SEOUL & 2015 UMF KOREA Facebook page and tell us which article in the June issue you liked best, which content you’d like to see more of and a link to your Instagram account. We will draw the names of 20 participants – 10 for June 12, 10 for June 13. Sorry, you can’t choose the date. IMPORTANT: The deadline for this event is 10PM of June 2! The June issue of SEOUL is out! In this issue, we explore the hip Seongsu-dong area, climb Jejudo’s beautiful volcanic cones, talk with Benjamin Joinau and Elodie Dornand de Rouville of Sketches of Korea, dine at some Korean gastropubs and much, much more. And don’t forget the Goings on Around Town, our roundup of the month’s concerts, exhibits, festivals and events. If you’d prefer a digital version, get SEOUL’s digital app (iOS, Android). NOTE: Digital version of June issue available now for Android, from tomorrow for iOS. Is Korea’s startup culture hindered by misguided ambition? Korea’s hanok hotels blend Korean tradition with Western hospitality. The K-Wave hits New Zealand. Tours of the gritty Changsin-dong district bring two Korean artists to life. 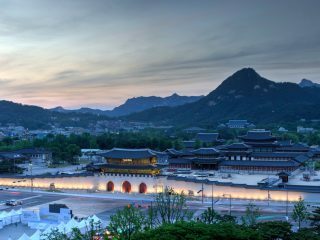 More Chinese tourists are visiting Korea, but they are spending less per capita. A travel photographer (great guide, BTW) falls in love with Ikseon-dong teahouse Tteuran. A misty Metasequoia Road in Jinan. Stars and reflections in Hadong. Enjoy Dragon Hill Spa for Less! Treat yourself to a day at Seoul’s top spa for KRW 2,000 less! Print out this coupon for a KRW 2,000 discount at the Dragon Hill Spa, a total leisure complex conveniently located next to Yongsan Station. You’ve read about it in the New York Times and CNN. Now experience it for yourself… for KRW 2,000 less. Explore Seoul’s fascinating Jeong-dong district – Seoul’s historic legation quarter – in the moonlight. On May 29-30, about 20 of Jeong-dong’s historic sites, including the rarely opened U.S. ambassador’s residence, will be open to the public at night. There will be cultural events, too, including a performance by the Seoul Pops Orchestra at Deoksugung at 7 PM on Saturday, a brass band performance at the old Salvation Army headquarters, and organ performances at the district’s historic churches. SNSD’s Yoona will be in attendance, too. American singer-songwriter Rachael Yamagata, Korean rocker Kim Yuna (the frontwoman of rock band Jaurim) and French pop sensation Keren Ann lead a star-studded lineup in this yearâ€™s Muse Incity, Korea’s only music festival for female artists, now in its third year. Also on the lineup is Joe Won Sun of the Korean band Rollercoaster, Australian singer-songwriter Kat Frankie and Korean artists Earip and Linus’ Blanket. While other music festivals focus on specific genres such as rock or EDM, Muse Incity transcends the limits of genre to invite female artists from all over the world for a one-day celebration of women’s musicianship. While the city has been a favorite subject among all forms of contemporary art, photography is one area in which urban landscapes are highly visible. In this exhibit of works by celebrated Korean photographers Area Park and Kang Hong Goo, the artists look at the impact that disasters and the subsequent redevelopment have on the lives of those who live through them. The work raises questions regarding what is disappearing from today’s cities, what is left behind and how never-ending transformation impacts the lives of urban denizens. In exploring these concepts, Park and Kang seek to gain some insight, however limited, on the meaning of today’s metropolises and allow us to visit their hidden spaces and remember these urban spaces before they disappear. Kang’s work focuses particularly on the transformation of residential neighborhoods due to redevelopment from the 1990s, while much of Park’s work examines the aftermath of the 2011 tsunami and the subsequent nuclear disaster at Fukushima, Japan. GETING THERE: Seoul Grand Park Station­ (Line 4), Exit 4. Take the shuttle bus. Digital art is an evolution of photography, going beyond the mere technical reproduction of the subject through the addition of artistic creativity after the shot is taken. Photographer HACHOONKEUN takes familiar Korean scenes and transforms them into beautiful but mysterious vistas, and in so doing attempts to propel the photography genre forward to new spaces and ideas. The RAS invites you to join a tour to the special exhibition on Korean Shamanism (musok) and Folk Beliefs of Korean villages at the National Folk Museum of Korea. Before entering into the special exhibition hall on Korean Shamanism, at the garden of the National Folk Museum of Korea, you will take a look around the variety of objects on Korean folk beliefs such as Sotdae, Jangseung, stone piles, stone sculptures of sexual organs, which were discovered easily at traditional villages in the past, a memorial gate & stone for the filial piety from Buan county, statues of civil officials (Muinseok), a stone tablet and an epitaph to be discovered near tombs as well as a replica of tomb. The special exhibition is titled “Korean Shamanism from the Vision of Folklorist Kim Tae-gon”. At the ongoing exhibition you will be able to find rare relics and materials with regard to Korean Shamanism, collected by pioneering master folklorist, Kim Tae-gon. Gyeongbokgung Palace at dusk. Photo by Robert Koehler. http://magazine.seoulselection.com/wp-content/uploads/2018/01/Seoul-logo.png 0 0 rjkoehler http://magazine.seoulselection.com/wp-content/uploads/2018/01/Seoul-logo.png rjkoehler2015-05-29 09:28:462015-07-18 17:32:56SEOUL Weekly: SEOUL’s 2015 UMF Korea Event!